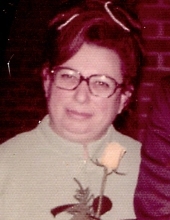 Myrna Mae Miller, 96, of Howard, WI, was called home on April 12, 2019. She Married Clarence Bohl in 1946 and he passed away in 1964. She married Herbert Miller in 1973 and he passed away in 2005. Myrna and Herbert enjoyed the good life of traveling throughout the United States. She is survived by many nieces and nephews. As per Myrna‘s wishes there will be no formal services. She just asked to let everybody know that each and every one had a special place in her heart. The family would like to thank Unity Hospice and Brookview Meadows for their unwavering care and compassion for Myrna. She will be deeply missed by her family and friends. Rest in Peace Myrna. To send flowers or a remembrance gift to the family of Myrna Mae Miller, please visit our Tribute Store. "Email Address" would like to share the life celebration of Myrna Mae Miller. Click on the "link" to go to share a favorite memory or leave a condolence message for the family.